A giant sign faces Paradise Bay. Want a burrito? Then walk over to Malibu-Ritos at Paradise Pier. But dont get your hopes up. Malibu-Ritos has four pick-up windows. None of them are open during the slow seasons. Unfortunately, the slow seasons at this park are winter, spring, summer, and fall. Even if you cant order a burrito, you can read the menu and think about how good these items might taste if Malibu-Ritos were ever open. A basket loaded with blueberry, Cinnamon Apple, Banana, Pineapple and Chocolate tortilla Crisps, doused with cinnamon apple sugar and drizzled with caramel sauce. Maybe Malibu-Ritos will be open next time. A very unusual photo: Malibu-Ritos is open for business! Wow! Two windows are open. The napkins and condiments are stocked. And theres no line. Now your decision is chicken, vegetarian, or beef. Some tables have large umbrellas; some dont. Take your burrito to a nearby table. Listen to the screams from the roller coaster that surrounds you as you bite into the soft flour tortilla folded around the hot, meaty (or meatless) filling. If you put guacamole, salsa, and sour cream in your burrito, be careful how you hold it avoid staining your shirt with a souvenir of Paradise Pier. Malibu-Ritos is near the right edge of this photo. Malibu-Ritos is easy to find. 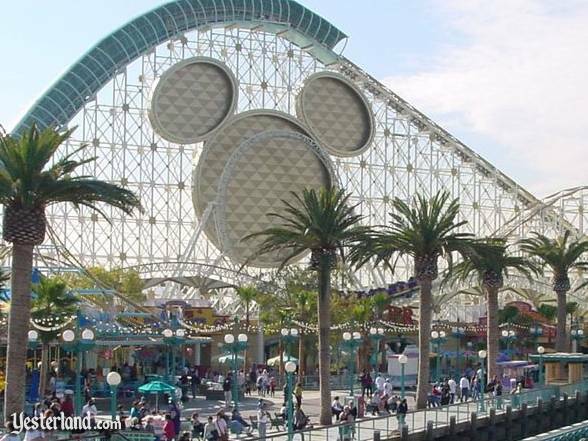 Just look for the giant Mickey Mouse circles on the roller coaster. 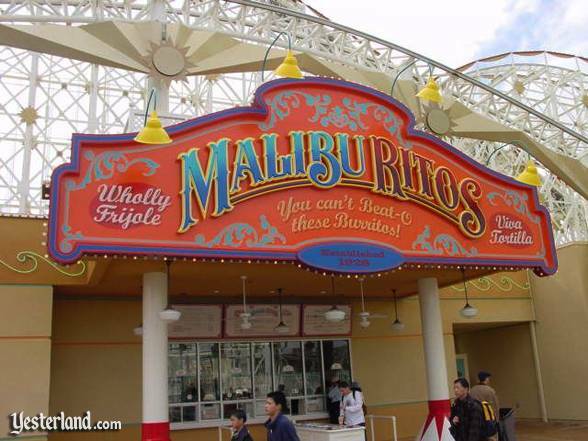 Malibu-Ritos opened in February 2001 as one of the many eateries of Disneys California Adventure. As was the case with several of the new parks shops, restaurants, and rides, the name was a play on a California location name—in the case, Malibu, a Southern California city that stretches for 21 miles along the Pacific coast. (Other examples are Man Hat n Beach, the Bakers Field Bakery, Bur-r-r Bank Ice Cream, and Maliboomer, another reference to Malibu). Toy Story Midway Mania replaced Malibu-Ritos. 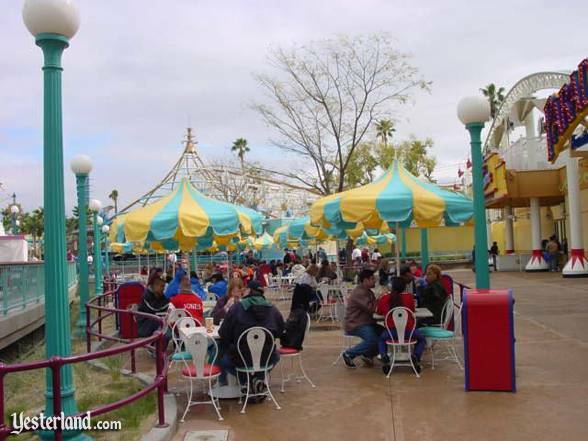 Technically, Malibu-Ritos lasted until September 2006, when the construction walls went up for Toy Story Midway Mania. In reality, Malibu-Ritos closed in 2001, as soon as it became apparent to park management that there were too few guests and too many places to eat. 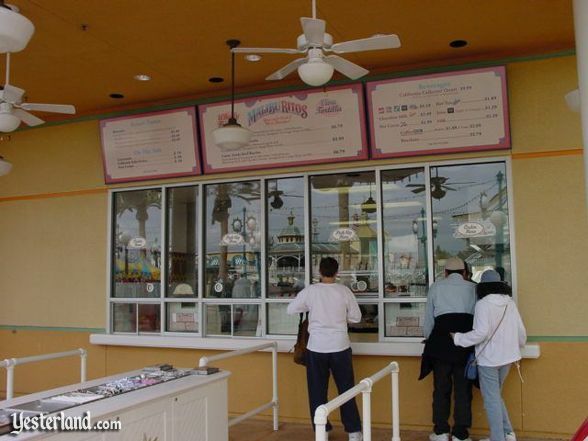 In this article, the photo of Malibu-Ritos open for business is from February 18, 2001—just ten days after the public grand opening of Disneys California Adventure. 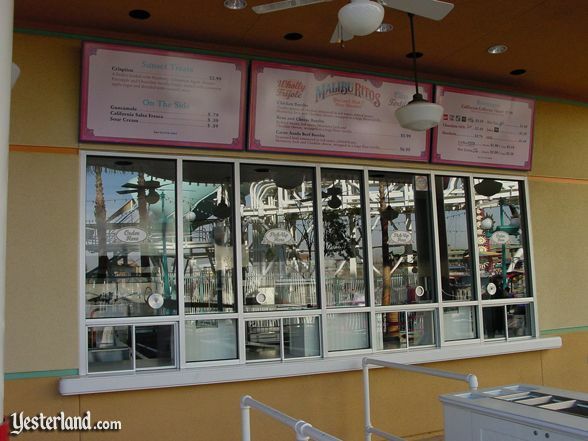 The menu board was updated over the years, such as when soft drink prices went up throughout the park. But that doesnt mean that guests could order food off that menu. Members of the MiceChat.com discussion board commented that even on days when Disneys California Adventure was packed, Malibu-Ritos was closed. If Malibu-Ritos was ever open after 2001, it eluded the online community. 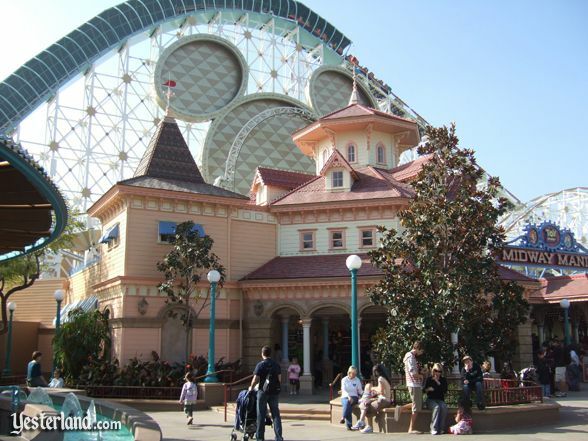 Now, please take another look at another Paradise Pier restaurant that didnt last long—Avalon Cove by Wolfgang Puck. Updated February July 10, 2012. Photograph of Malibu-Ritos sign: 2001 by Allen Huffman. Photograph of Malibu-Ritos, closed: 2002 by Allen Huffman. Photograph of Malibu-Ritos, open for business: 2001 by Allen Huffman. Photograph of Malibu-Ritos seating: 2001 by Allen Huffman. Photograph of Malibu-Ritos location: 2001 by Allen Huffman. Photograph of Toy Story Midway Mania: 2008 by Allen Huffman.